I have started making Grammar practice worksheets to send home with my students for extra practice. These correlate directly to the McGraw Hill Wonders Reading/Grammar for the Unit/Week. This worksheet is a two page practice for the suffixes: -ly and -ful. 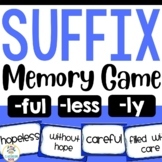 The students must add the correct the suffix and write the new meaning of the word. There are also 5 questions that have the students use a given word in a sentence as well. Enjoy! 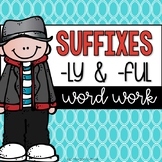 Here's a quick and fun activity to practice prefixes and suffixes with your students. Works on -ly, -ful, un- & dis- and it's actual meanings. Enjoy the little activity/assessment! 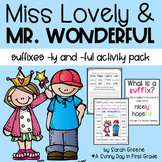 Give your students practice using the 'ly' and 'ful' suffixes with this fun word sorting activity. This activity is very easy to prepare. To play, students turn over a base-word card and a suffix card to see if it makes a new word. If so, students record the new words on the recording sheets. 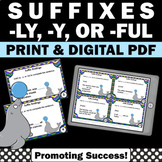 This is a set of two literacy activities for suffixes -ly and -ful. It includes a word sort activity and a fill in the blank activity. It is a great resource to use for centers. This activity goes along with Reading Street, Unit 4, Week 6. It has the "oo" sound like moon and the endings -ful and -ly. It has enough activities for the week. Day 1- Roll, Read, Keep for -ful and -ly. The cards are color coded for my lower group to remind them of the sound they are looking for. 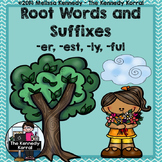 Here are 6 mini-books that have the students keep track of the meaning and practice adding the suffixes to root words. Easily cut and pasted together, perfect for centers and interactive notebooks.